I'll be honest and say that I've never read Fall For Anything. My library isn't that great, so any non-popular foreign book--because Canada is foreign to the average American--I want to read, I have to buy. That being said, I have read Some Girls Are and Cracked Up to Be, both of which are great examples of writing a likable, flawed protagonist. So, for all you writers out there, I decided to conduct an interview with Courtney Summers so that we could get some insight into her writing process. Luckily, Courtney was nice enough to answer my questions even though she was working under a deadline. me: In my opinion, Some Girls Are is the best young adult book that deals with cliques and mean girls. It makes Regina's situation realistic and gritty, without delving into melodramatic territory. When writing Some Girls Are, did you draw inspiration from Mean Girls, Clueless, and other clique oriented entertainment such as Gossip Girl? CS: Thank you! I appreciate that. While I've enjoyed Mean Girls and Clueless and Gossip Girl, Some Girls Are was very much inspired by the bullying I went through when I was in school. As a girl who bullied and was bullied, I spent a lot of time analyzing my experiences and trying to understand them. Ultimately, I really wanted to acknowledge the vicious dynamics female friendships have sometimes--not all the time!--and the extreme hurt girls are capable of causing each other. That's really what I drove me as I wrote. Mean girls have always fascinated me. me: Many reviewers have commented on the sheer force you wield with your writing. When you're writing, how do you tap into such strong emotions? Do you, for lack of a better phrase, get into the zone? CS: The feedback about how emotional my books can get for some readers is really gratifying! I do get into the zone BUT. I also have to write when I'm not in the zone. So I can't really depend on that when it comes to tapping into strong emotions for my characters. Honestly, I think part of why my books might read so emotionally to some people is that I'm a pretty emotional person in real life myself, and no doubt that shapes my approach, and I also think that one of the most important things for any writer to tap into is emotional truths-- for example, not everyone will go through the same situations a character does, but they can identify with what it feels to be lonely, happy, afraid, mad etc--and that's always at the forefront of my mind when I'm writing as well. me: Your protagonists are considered to be unlikable by a few reviewers, although in my opinion they're refreshingly snarky and cynical. How do you maintain a balance of positive and negative characteristics in your protagonists so that they remain realistic, but the audience is still able to sympathize with them? CS: I'm so glad you think so! This is a really good question. When I write, I try to make sure my characters react as honestly as possible to the situations that I throw at them. The more honest those reactions are, the more I hope my characters will be understood by my readers. Whether or not they're likable or sympathetic, I want them to be understood. So I think I'm trying to maintain that level of honesty throughout and that's where (hopefully) the balance and the realism comes from. me: The relationships in Some Girls Are and Cracked Up To Be are a nice change from the standard true love relationships of many young adult books. When writing, how do you keep the relationships balanced? Also, do you believe that your characters were made for each other--aka Regina and Michael--and that they stay together beyond high school? CS: So far, in most of my books, the romantic relationships are pretty secondary to the other things my characters are going through at the points in their lives that I'm writing about--they just sort of happen and complicate situations. I try to maintain the balance by not letting the romance overshadow the larger emotional arc. In my last three books, I wanted the romance to complement it, but I didn't want it to be the main focus. Like, Parker and Jake's relationship in Cracked Up to Be was a smaller part of a much larger picture. It was needed and it played catalyst, but it ultimately wasn't about whether or not those two were meant to be together forever and ever. me: In your books, you've managed to differentiate between right and wrong without sounding preachy. Do you write with a particular set morals in mind? CS: It's kind of funny--I've been accused of having no morals and being a very irresponsible writer more than once in my career. It's so subjective. So that sense of right and wrong, where those lines fall, are generally dictated by the story itself. It all depends on the book. I just go where the characters lead me and trust in that. I never want to use my books to preach to readers. I don't want moralize at the expense of what I'm writing, ever. I trust my readers and I want them to draw their own conclusions about those things when they read my work. Archie Comics Digest Magazine No. 81! Actually, the last book I read is one I have to keep under wraps but the Archie Comic was directly after it so at least there's that. Also, objectively, it was one of the better Archie digests. It's a tie between The Chocolate War by Robert Cormier and In the Miso Soup by Ryu Murakami (which is not a YA novel). Both are incredibly intense and disturbing and provoking. Battle Royale by Koushun Takami is really close behind them. What author would you like to meet in person? Ack! It's hard to pick just one--so I won't. Nova Ren Suma, Daisy Whitney, CK Kelly Martin, Amy Reed, Kirstin Cronn-Mills--all such intensely talented women! It would be an honour to meet them face to face. And, who's your favorite under-appreciated author? 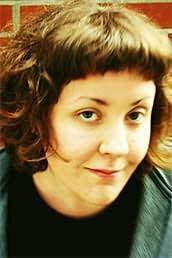 Also hard to pick just one--I would love love LOVE to see everyone on the entire planet reading CK Kelly Martin (author of I Know It's Over, One Lonely Degree, The Lighter Side of Life and Death and the forthcoming My Beating Teenage Heart) who is just one of the best contemporary authors out there right now. Everything she has written is golden. And also Amy Reed, who wrote Beautiful (and her next book, Clean, is coming out this summer) has one of the most raw and honest voices in YA--there's really nothing like it--and anyone who is not reading her should be, in my opinion! Courtney Summer is the Author of CRACKED UP TO BE (2009), SOME GIRLS ARE (2010) and FALL FOR ANYTHING (2011), all from St. Martin's Press and available wherever books are sold. You can reach her here. I'll have to look these books up. Thanks for posting this, bloodfiend! I agree! I had no idea Courtney Summers was from Canada. This just made my day! I love all of her books and can't wait to get my hands on Fall for Anything. They're just so ... raw. I can't even describe how much I like her writing. Much thanks, bloodfiend! too. I don't much care for Amy Reed, but C.K. writes some good books. Her Some Girls Are is one of my favorites I've read in 2011. It's amazing.